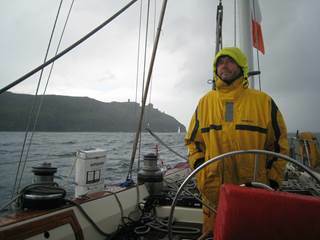 When transiting the west coast of Ireland, it is prudent to know where to hole up for the night should the weather turn sour, which it can do so very quickly. Lying off the Iveragh Peninsula in the southwest of County Kerry, Valentia Island (Dairhbre; the island of the oak forest) offers such refuge. 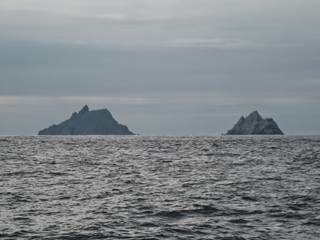 Just past the remarkable Skelligs rising up from the ocean’s depths to dizzying heights, this is a place that’s easy to tuck into, except in a NW gale. Not only that, the hotel has received an upgrade, Walsh's shop has reopened for the first time in 20 years, and Dark Sky Reserve has just received permission for an observatory on Geokaun Mountain. Add to that the quarry that roofed the British Parliament House, an estate with Australasian sub-tropical gardens, and walking trails that take you everywhere and you've got a fantastic holiday destination and not a bad stopover for a cruising sailboat. 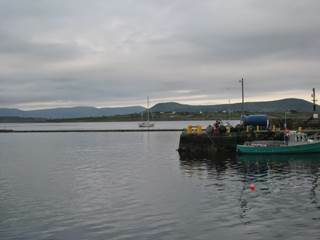 Valentia Harbour is on the south side of the entrance to Dingle Bay, in a sheltered bight between Valentia Island and the mainland. 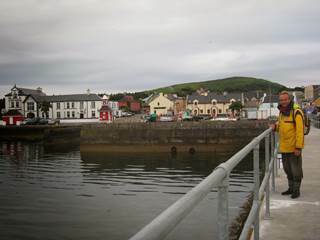 Knightstown, the main village on the island, is a fishing port with a marina under construction. 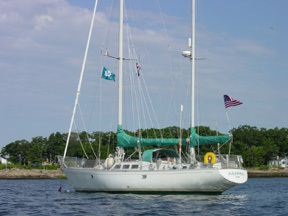 It provides visiting yachts with a sheltered anchorage and moorings. 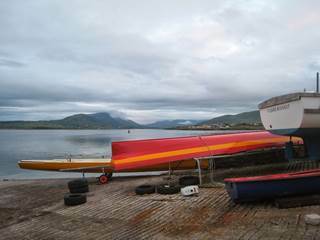 Knightstown is an excellent harbour that affords protection from all wind and sea conditions. 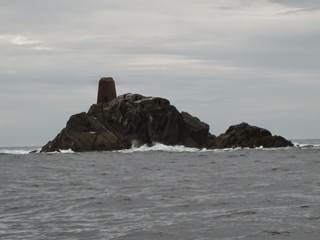 The preferred approach to Valentia Harbour is around Bray Head, a bold headland with high cliffs. Come around Reenadrolaun Point and then turn to starboard steering a mid channel course between Fort (or Cromwell) Point and Beginish Island. Be sure to consult and follow the sailing directions carefully to stay well clear of Fort Point where there are submerged rocks. This main entrance to the north of the island has straightforward access at any state of the tide, supported by a sectored light and good markers around a rock in the entrance. The southern approach via Portmagee Sound is for smaller boats. 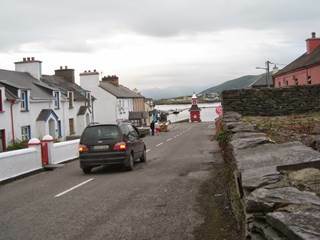 It has a narrow, shallow and tricky approach with a road bridge at Portmagee. 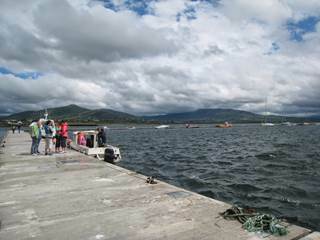 There are visitor’s moorings at Portmagee but the pier is generally occupied by fishing and tour boats. 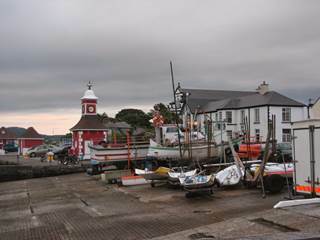 Portmagee also offers a bar and restaurant, a general store, and a post office. Please note during northwest gales Valentia Harbour should be avoided. 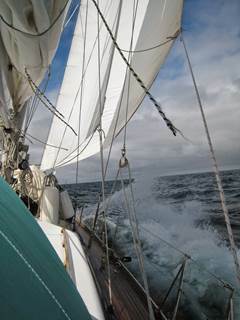 A heavy sea breaks across the harbour entrance and you should not attempt it unless you have a highly competent crew with very good local knowledge. Valentia offers several options. First, there is a lovely and protected anchorage tucked into the corner by Glanleam House just the other side of the spit of land from the Coast Guard Station and quarry where you can have lovely views of the big house on shore. Stay clear of the marked Harbour Rock. This is a quiet anchorage with nothing to do but swing in very pristine and idyllic surroundings of high forested hills. 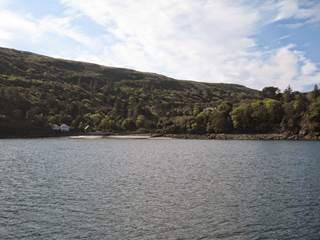 This anchorage is good for a an overnight stop if you are not planning to go ashore. 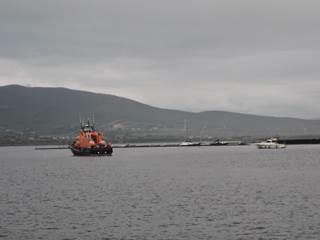 If you continue on into Valentia Harbour, Knightstown will come into view to starboard. Yachtsmen will find this a very secure spot to stop with good visitors moorings and a large pontoon to which you can tie up. Knightstown Ferry Pier reputedly has a depth of 1.7 m at the pierhead (51° 55.580' N, 010° 17.160' W) and you can come alongside during the day for a short period. But there is no need as there is a large pontoon to which you can tie up. 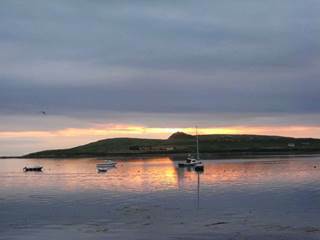 It is quite pretty and where all the island’s facilities are located – pubs, restaurants, dive schools, lifeboat, hotel, shoppes, and ferry. There is a vast breakwater pontoon in a square configuration connected to the shore via a massive jetty. The plan was to have a 200-berth marina here, but it never progressed past the breakwater stage. That makes for a wonderful place to tie up and easily access the town. The best place to tie up is on the inside of the pontoons where the swell of passing boat traffic is minimized. There were visitor moorings just beyond the breakwater but we’ve been told those have been removed. Outside the area where the moorings used to be makes a very nice anchorage if you prefer to avoid the pontoons. Keep in mind that a car ferry sails from Reenard Point to Knightstown. Caution: When anchoring in the vicinity of Knightstown please identify and avoid the submarine cable laid between the town and Reenard Point marked on all charts. 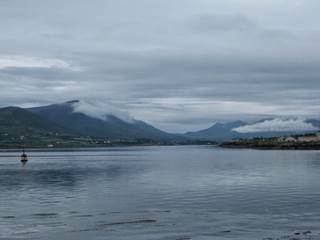 Two miles up the Fertha River is the town of Cahersiveen. 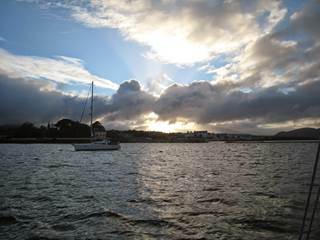 It has a 105 berth marina, supermarkets, shops, banks, library, restaurants and about 20 pubs. 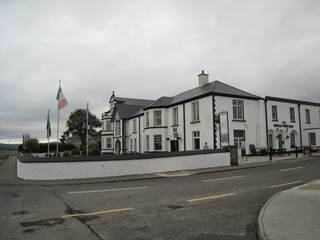 It is the main business centre of the peninsula and located right on the Ring of Kerry. 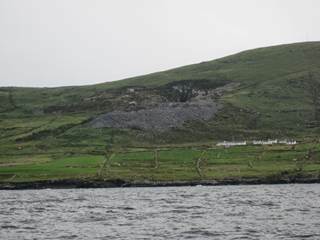 The main village on Valentia Island, Knightstown, was developed as a planned settlement by Sir Peter George Fitzgerald, the 19th Knight of Kerry (1808–1880) in the 1830s. That accounts for its Victorian architecture. 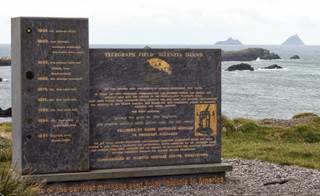 Valentia is perhaps best known as the site of the first successful transatlantic telegraph station, which remained operational from 1866 to 1966. The transatlantic cable lay between Valentia and Newfoundland. 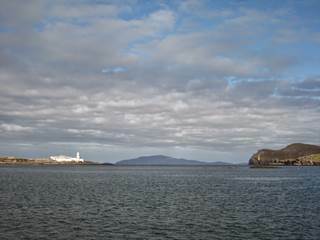 Valentia is also home to one of Ireland’s VHF radio coast stations, which is now also a coast guard station. It sits high on the hill as you pass by the northwest coast. The U.S. Coast Survey mounted a longitude expedition in 1866 to eliminate the uncertainty in measurements that existed at the time. October 24, 1866 synchronized longitude observations were conducted between Valentia Island and Heart's Content, Newfoundland. The measurement was part of a campaign to accurately determine the longitude of multiple locations along the 52nd parallel from Valentia to Omsk, Siberia. The timing of astronomical observations at this location was synchronized with simultaneous observations by the Royal Observatory in Greenwich via telegraph. 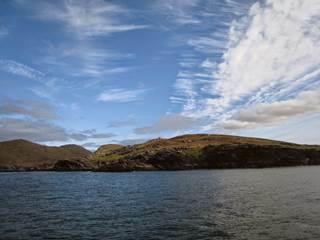 Valentia Island is geologically mainly sandstone. The slate quarry operated for almost a century but closed in 1911, only to re-open in the 1990s. The slate is particularly useful for large flat slabs and was used for roofing (Houses of Parliament in Westminster) and counters or shelving (Public Records Office in London has 21 miles of shelves made of Valentia slate). One of the oldest signs of vertebrate life on earth was identified on Valentia. In 1993, a student discovered tetrapod tracks preserved in the rocks. Tetrapods are 4-legged vertebrates. These tracks were then made by the forebears of all living and extinct amphibians, reptiles, birds, and mammals, including dinosaurs. The permanent population of the island in 2006 was 713. The island is approximately 11 kilometres (6.8 mi) long by almost 3 kilometres (1.9 mi) wide. The main things to do are relax and take a hike. There are multiple walks for natural scenic beauty, wildlife viewing, and historical interest. 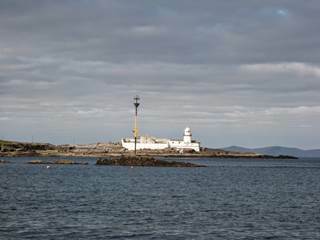 The island hosts a heritage centre which tells the story of the natural, industrial, and communications history of the island, with exhibits on the Cable Station, the Marine Radio Station and the lifeboat. You can also visit the slate quarry which reopended in 1998 and provided slates for the British Houses of Parliament. 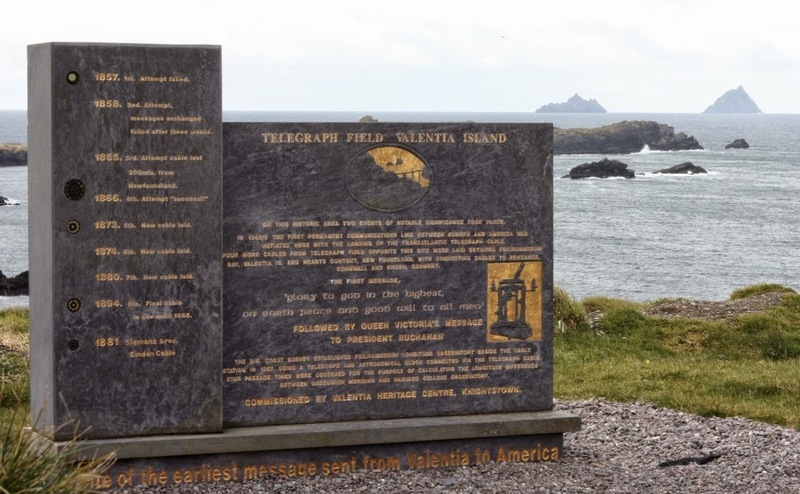 Visit Foilhommerum, The Telegraph Field (or Longitude Field) is the site of the first permanent communications link between Europe and America. Bray Tower on Bray Head is the ruined Napoleonic lookout tower. Geokaun Mountain and Fogher Cliffs, the highest mountain and the sea cliffs of 600 feet (180 m) on the northern face of Valentia Island, are breathtaking places to visit. 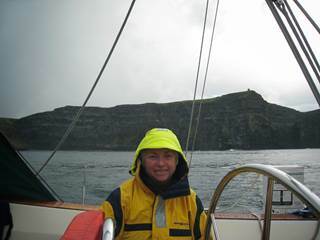 The American solo rock climber Michael Reardon died on 13 July 2007 at the Fogher cliffs of Valentia Island when he was swept out to sea by a rogue wave following a successful climb. The tetrapod trackway, where a four-legged amphibian – the ancestor to all dinosaurs, amphibians, reptiles, birds and mammals – left his mark during the Devonian period, is worth a visit if only for the scenery. It is not well sign posted. Head on the road towards the lighthouse and take a left toward the radio station. Before the radio station there will be a small car park on the left from where you can walk down to the sea. The last bit of road leading to the tracks is narrow, and the short hike down to the tracks is pretty steep, but easily doable. The tracks are embedded in rock right on the water and clearly visible. There is an explanatory sign about the marks. The site is of international importance, being well dated at older than 385 million years. (51°55′51″N 10°20′38″W) At the time, Ireland was part of a large continent south of the equator. On the northeast of the island stands Glanleam House amid sub-tropical gardens. The gardens are open to the public. Protected by windbreaks from Atlantic gales and never touched by frost, these gardens benefit from the mildest microclimate in Ireland. Sir Peter Fitzgerald planted these gardens starting in the 1830s and stocked them with a unique collection of rare and tender plants from the southern hemisphere. The gardens are laid out in a naturalistic style as a series of walks. There are plants from South America, Australia, New Zealand, Chile, and Japan. There is even a golden-variegated Luma apiculata named "Glanleam Gold" that originated in the garden. 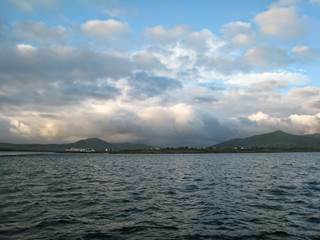 There are opportunities to spend the day fishing with local skippers or take a boat trip to the magnificient Skelligs, a UNESCO World Heritage Site, the most well preserved ancient Christian monastic settlement in Europe. The local world renowned dive sites have even been featured in the National Geographic magazine. Knightstown is the main village and is architecturally distinctive with a seaside Victorian flair that is unusual for the Irish countryside. The main street is very pleasant and lined with shops and small restaurants. The Altazamuth Stone on Peter Street commemorates the historical event that defined the world longitudinally - line by line. 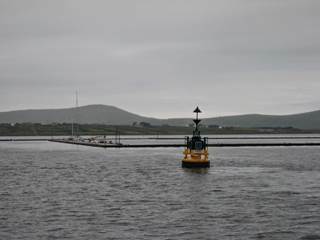 The Valentia Island Weather Station is located 25 metres above the mean sea level and closer to Cahersiveen on the mainland than to Valentia. It was moved many years ago but retained the name. Valentia Observatory is part of Met Éireann, the Irish Meteorological Service. The observatory was set up in August 1868. Valentia Island is, on average, the wettest weather station in Ireland. 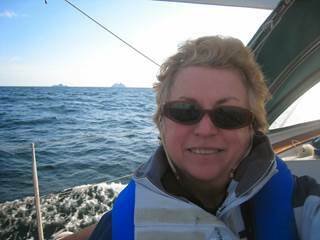 Whatever you do, bring foul weather gear! There are four restaurants in town. 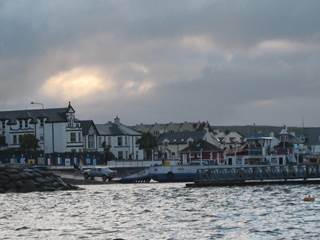 The clock tower provides a focal point at the bottom of the main street and the Royal Valentia Hotel and Royal Pier restaurant, operating since 1848, occupies center stage on the waterfront. The Knightstown Coffee House and book store provides a chance to peruse potential purchases while sampling the tasty treats from June through September. The Fuschia Restaurant & Courtyard is up the street towards the church. The Coffee Dock right on the waterfront is known for their fabulous views and their crab claws in garlic butter. Diving services are available on the island. There is a boat repair shed on the waterfront. 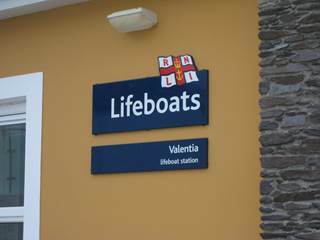 It is best to ask at the Lifeboat station what services are available. As of our visit, there was no water or electricity on the pontoons. You will find supplies limited to some general stores and fuel. There is a boatyard on the island that is capable of lifting a 20 tonne yacht and some repairs. An RNLI Lifeboat is stationed on the island and there are dive services available. Emergencies are worked on 16, 67 and working channels. 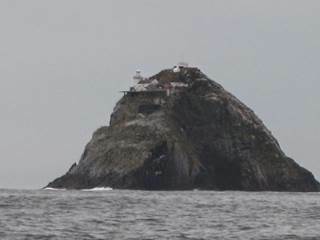 ICG Valentia Maritime Rescue Sub-Centre (MRSC) VHF Ch 24 & MF 1752 kHz covers this coastal area. Cork (26), Mizen (04), Bantry Bay (23), Shannon (28) and Galway (04) provide relay stations. · Swimming spots : Murphy’s strand, The rock pool ‘Pol Gorm’ at Culloo local legend was that this was a famous naked swimming spot in my grandmothers time! · Glanleam House & Sub Tropical Gardens created by the 19th Knight of Kerry during the 19th century. The gardens spread across 40 acres, flourishing with plants from all around the world and in particular those native to Australasia. 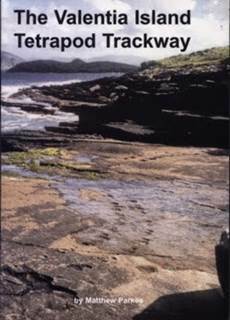 · Tetrapod Trackway (prehistoric dinosaur footprints made over 350 million years ago at a time when Ireland lay south of the equator. 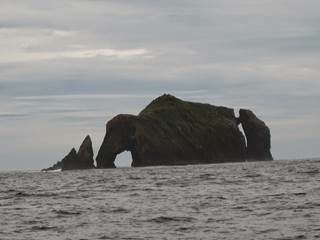 It is one of the earliest records of tetrapods in the world, making Valentia a valuable geological heritage site. · Valentia Slate Quarry (The Slate quarry opened in 1816 and is still active today. Slate roofed the London House of Parliament. · Bray Head tower a ruined Napoleonic lookout tower. The barren dramatic cliffs of Culloo and Bray head dominate the west of the island. 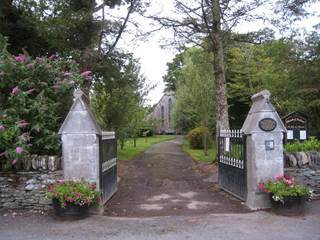 Transport is available via bus (bus eireann services) from Caherciveen & Kerry airport at Farranfore is 80–90 minutes away by car. The island is accessible by car all year round via the bridge at Portmagee. A car ferry runs from May to late September from Renard to Knightstown. There is local taxi, bus and bike hire services. · Walshe's & Ready’s local shoppes in Knightstown.